Power your APIs with a three-time leader. 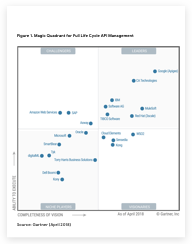 We’re thrilled to share that Gartner has recognized Apigee as a Leader in the 2018 Magic Quadrant for Full Life Cycle API Management. This year, Apigee was not only positioned furthest on Gartner’s "completeness of vision" axis for the third time running, it was also positioned highest in "ability to execute." Download your complimentary copy of the 2018 Gartner Magic Quadrant for Full Life Cycle API Management. This must-read for IT professionals provides a comprehensive analysis of the API management marketplace and evaluates 22 vendors across 15 essential criteria. Fill out the form to get the ebook and receive a copy via email. Sign up for Google Cloud emails with news, product updates, event information, special offers and more. You can unsubscribe at a later time. This graphic was published by Gartner, Inc. as part of a larger research document and should be evaluated in the context of the entire document. The Gartner document is available upon request from Apigee. Gartner does not endorse any vendor, product or service depicted in its research publications, and does not advise technology users to select only those vendors with the highest ratings or other designation. Gartner research publications consist of the opinions of Gartner’s research organization and should not be construed as statements of fact. Gartner disclaims all warranties, expressed or implied, with respect to this research, including any warranties of merchantability or fitness for a particular purpose.